To Cite: Jamal M, Hussain T, Rajanna Das C, Andleeb S. Isolation and Characterization of a Myoviridae MJ1 Bacteriophage Against Multi-Drug Resistant Escherichia coli 3, Jundishapur J Microbiol. 2015 ; 8(11):e25917. doi: 10.5812/jjm.25917. Background: Antibiotic resistance in Escherichia coli, a member of the Enterobacteriaceae, is of particular concern because it is the most common (Gram-negative) pathogen causing nosocomial and community infections. Researchers are now considering the use of phages for the control of various antibiotic-resistant bacterial infections. Objectives: The purpose of this study was to isolate and characterize a novel pathogenic/lytic phage that targets multi-drug resistant (MDR) E. coli 3, and to investigate its effectiveness at lysing this bacterium. Materials and Methods: A clinical strain of E. coli 3 was identified based on its 16S rRNA sequencing and its antibiotic resistance profile was determined by the disc diffusion method. A bacteriophage was isolated from wastewater and its various characteristics, such as host range, heat tolerance, pH stability, one step growth, total protein content, and genome size, were determined. The antibacterial property of the phage was determined against log-phase bacterial planktonic cells at 37°C. Results: The bacteriophage, designated MJ1, was isolated by testing against a clinical MDR E. coli 3 strain. The MJ1 phage showed a wide range of heat and pH stability. The phage morphology, determined by transmission electron microscopy, revealed a structure comprised of a head (108 ± 0.2 nm long by 128 ± 0.5 nm wide) and a contractile tail (123 ± 0.5 nm long by 15 - 26 nm wide). These features placed the MJ1 phage in the family Myoviridae and the order Caudovirales. Eleven structural proteins (17 to 200 kDa) for this phage were detected by sodium dodecyl sulfate polyacrylamide gel electrophoresis (SDS-PAGE). A double stranded DNA, approximately 32 kb, in size was detected for this phage on agarose gels. The phage efficacy against E. coli 3 planktonic cells was also investigated. The MJ1 phage demonstrated a very good capability to reduce the numbers of E. coli 3 planktonic cells, as determined by a change in the bacterial growth (an optical density decrease at 600 nm from 0.40 to 0.12). Conclusions: MJ1 phage has much potential for use in phage therapy and other applications. Escherichia coli is a Gram-negative, rod shaped bacterium that is involved in various nosocomial infections. One major problem concerning bacterial infections, in both developing and developed countries, is the emergence of resistance in bacteria against potent broad spectrum antimicrobial agents (1). Amongst the Enterobacteriaceae, E. coli, one of the most common human pathogens, has developed a high level of resistance against several previously effective antibiotics. Multi-drug resistant (MDR) E. coli can disseminate resistance not only within the same family, but also to distantly related bacteria through mobile genetic elements (2). Among different strains of E. coli, Shiga toxin-producing Escherichia coli (STEC) and enteropathogenic Escherichia coli (EPEC) have emerged as the most clinically important strains; the former is an important zoonotic food-borne pathogen while the latter is a major cause of diarrhea in children in developing countries, confirming the risk to public health (3). Moreover, E. coli strains can also produce biofilms on multiple biotic and abiotic surfaces (4), as well as on indwelling medical devices (5). They cause various nosocomial and chronic infections in humans (6), and are mostly known for their high association with hospital acquired infections (7). The high antibiotic resistance in bacterial strains has prompted a search for alternative approaches to control the frequency of the emergence of antibiotic resistance in bacterial strains. Researchers have, therefore, advised the application of phages to replace the use of antimicrobial drugs. Phage therapy is considered more beneficial than antibiotics because it is safer and more specific in activity (8, 9). Application of bacteriophages to treat/control bacterial infections is known as phage therapy (8). These viruses are (obligate) bacterial parasites that bind to bacterial surface receptors and inject their nucleic acid (usually DNA). The subsequent replication of phages inside the host bacterium results in lysis of the bacterial cell (10). The advantage of the use of phages over antibiotics arises from the fact that the mechanism by which phages cause lysis or death of the host cells is entirely different from the mechanisms of antimicrobials drugs (8). The earth biosphere contains a very large number (≈1031) of bacteriophages (11), but few of these have been characterized (12). Hence, novel phages need to be isolated and evaluated for use in the eradication/control of MDR and biofilm forming human pathogenic bacteria (13). However, newly isolated and identified E. coli strains may have different susceptible to currently existing phages and may already be totally resistant to them. Therefore, the search must continue for coli phages with broad host ranges to combat newly emerged and extremely drug resistant E. coli strains. This study focused on the isolation and partial characterization of a novel lytic Myoviridae bacteriophage effective against a clinical MDR strain of E. coli 3 and on the determination of its lytic activity against its host bacterium planktonic cells. A clinical isolate of E. coli (a gifted from the Railway General Hospital, Rawalpindi, Pakistan) was identified by ribotyping. Genomic DNA was extracted using a DNA isolation kit (Invitrogen, USA), following the manufacturer’s protocol. The polymerase chain reaction (PCR) with primers (RS-1:5ˊ-AAACTCAAATGAATTGACGG-3ˊ and RS-3: 5ˊ-ACGGGCGGTGTGTAC-3ˊ) was performed for amplification of the 16S rRNA gene, as previously described by Jamal et al. (14), and the products were resolved by (1%). agarose gel electrophoresis. The eluted PCR products (gel elution kit; Invitrogen, USA), were sequenced, followed by sequencing analysis. The susceptibility of E. coli 3 to different groups of antibiotics was tested using a clinical and laboratory standards institute (CLSI) established protocol (15). Escherichia coli 3 was tested with ten known antibiotics, as shown in Table 1. The clinical isolate was evenly spread on agar plates containing Luria Broth (LB) and antibiotic discs were placed at fixed distances from one another. The plates were then incubated overnight at 37°C. Several wastewater samples were collected from different locations of Rawalpindi, Pakistan, and the MJ1 bacteriophage was isolated using previously reported methods, with slight modifications (16). The plaque assay, the most commonly used technique for estimating phage counts, was performed by adding equal amounts (100 µL) of diluted phage suspension and E. coli 3 (OD600 = 1) culture to 3 mL of soft LB agar (50°C) in a tube, mixing, and pouring the mixture into LB agar plates. The plates were dried for 20 minutes and the agar was allowed to solidify fully. The plates were incubated overnight at 37°C and then observed for the presence of plaques by comparison with a negative control plate. A number of pathogenic bacteria, including both Gram positive and negative types, were tested for determination of the host range of the MJ1 phage; these included common pathogenic bacteria, such as E. coli strains, Pseudomonas spp., Staphylococcus spp., Klebsiella spp., and Achromobacter xylosoxidans (Table 2). The susceptibility of the bacterial strains was evaluated by spot tests (17) and further validated by agar overlay assays. The plates were incubated overnight at 37°C and each plate was observed for the presence of plaques and compared with an uninfected negative control. a+, Susceptible; and -, Resistant. Phage characterizations, such as thermal and pH stability tests, were conducted according to previously described protocols, with minor adjustments (18). The MJ1 phage suspensions were treated for 1 hour at temperatures ranging from 37 to 80°C. After 1 hour, the survival of the treated phage was checked by the soft agar overlay method. The pH stability was checked using a wide pH gradient from pH 1 to 11 (pH 1, 3, 5, 7, 9 and 11). Each experiment consisted of adding 1 mL of phage suspension to 9 mL tryptic soy broth (TSB) at the desired pH and incubating at 37°C overnight. Phage survival was determined by the soft agar overlay method for every treated sample. The latent time and burst size of the MJ1 phage was estimated using the protocol described by Sambrook et al. (19). A 50 mL volume of E. coli 3 was incubated until the culture reached the mid-exponential phase OD (0.6); at that point, the bacterial cells were pelleted by centrifugation (12000 × g). The pellet was then mixed with 0.5 mL LB broth medium and 0.5 mL phage (4.5 × 108 plaque forming unit /mL). This mixture was left to stand for 1 minute to allow phage adsorption, followed by centrifugation at 20,000 × g for 40 seconds to remove non-adsorbing phages. The resulting pellet was resuspended in 100 mL media and kept continuously at 37°C. Samples were collected at three-minute intervals and phage titers were estimated via the soft agar overlay method. The purified MJ1 phage particles were transferred to the surface of a formvar carbon film (on a 200 mesh copper grid), negatively stained by addition of 2% uranyl acetate, and blotted immediately with filter paper; the grid was then air dried for viewing by transmission electron microscopy. A transmission electron microscope (Hitachi, H-7000 Tokyo, Japan), located at the Interdisciplinary Center for Biotechnology Research (ICBR), University of Florida (UF), USA, operated at 100 kV, was used for detailed analysis of the MJ1 phage sample. The international committee on taxonomy of viruses (ICTV) guidelines were used for classification of the MJ1 phage based on the electron microscopy results (20). The MJ1 phage genomic DNA was isolated with a DNA isolation kit (Qiagen, Germany). A sample (40 μL) was then digested with EcoR1 restriction enzyme (New England Biolab, Canada) (19) at 37°C for 16 hours, run on agarose gel (0.7% w/v), and visualized with a UV transilluminator. The purified phage were suspended in phosphate buffered saline (PBS) (1X) solution. Eppendorf tubes containing 10 - 15 µL of phage suspension were mixed with loading dye and then kept on a heat block at 100°C for 10 minutes. The phage proteins were then separated by sodium dodecyl sulfate polyacrylamide gel electrophoresis (SDS-PAGE) on 12% acrylamide (21) and visualized by Coomassie Blue G-250 staining. The reduction in the bacterial strain numbers was assayed as described by Jamal et al. (14). E. coli 3 was inoculated into two separate flasks, each containing LB broth medium (100 mL), and both flasks were kept in a shaking incubator at 37°C. One of the flasks, at OD = 0.6 at 600 nm, was treated with phage filtrate with a multiplicity of infection (MOI) of 1 (2.1 × 1010 PFU/mL), while the other flask was left as a negative control (no phage). Both culture flasks were kept at 37°C with constant shaking, and OD (600 nm) readings were taken with a SP300 spectrophotometer (Optima, Japan) every 2 hours for up to 24 hours. All data were presented as means plus standard deviation. MS Excel (2007) was used for statistical analysis. Escherichia coli 3 was identified based on the partial sequence of the 16S rRNA gene. A DNA fragment of about 470 bp was amplified and sequenced in both the forward and reverse directions. The resulting sequence was submitted to NCBI for BLAST analysis. Its sequence was found 99 % identical to E. coli. The sequence was given the GenBank Accession no. KF385446. Antibiotic sensitivity indicated that the bacterial strain was resistant to gentamycin, amoxicillin, ampicillin, streptomycin, sulfametoxazole/trimethoprim, erythromycin, and tetracycline, but was susceptible to ceftazidime, doxycycline, and ciprofloxacin. The antibiogram appeared as a zone of inhibition, as shown in Table 1. A phage was isolated from sewage water using E. coli 3 as a host organism. The phage, designated as MJ1, produced clear plaques on a host bacterial lawn, which clearly indicated it to be a lytic phage. The average diameter of the plaques was about 0.8 mm, with distinct delineation (Figure 1). A, Spot test for the detection of MJ1 phage; and B, a higher dilution (10-6) of phage titer showing clear plaques with an average diameter of 0.8 mm. A total of 34 different bacterial strains were used to determine the MJ1 phage host range. The bacterial strain susceptibilities were first detected by spotting methods and further confirmed by agar overlay assays. Only three strains of E. coli, E. coli 3, E. coli LF 1968, and E. coli F, along with P. aeruginosa 2995 and A. xylosoxidans, were susceptible; the other bacterial strains were resistant to the MJ1 phage (Table 2). The MJ1 phage was therefore concluded to have a narrow host range. The MJ1 phage was quite stable (100 %) after incubation at 37°C for 1 hour at pH 7.0 and showed good stability between 37°C and 65°C. However, incubation at 70°C was lethal and completely killed the phage (Figure 2 A). The optimal pH was determined by treatment at 37°C for 16 hours at different pH values. The MJ1 phage stability was maximal at pH 7 and was also relatively stable at other pH values of 5, 9, and 11. The low pH values of 1 and 3 were lethal and totally inactivated the phage. Thus, both very high temperature and very low pH were lethal for the MJ1 phage, which may be a hindrance to phage therapy (Figure 2 B). 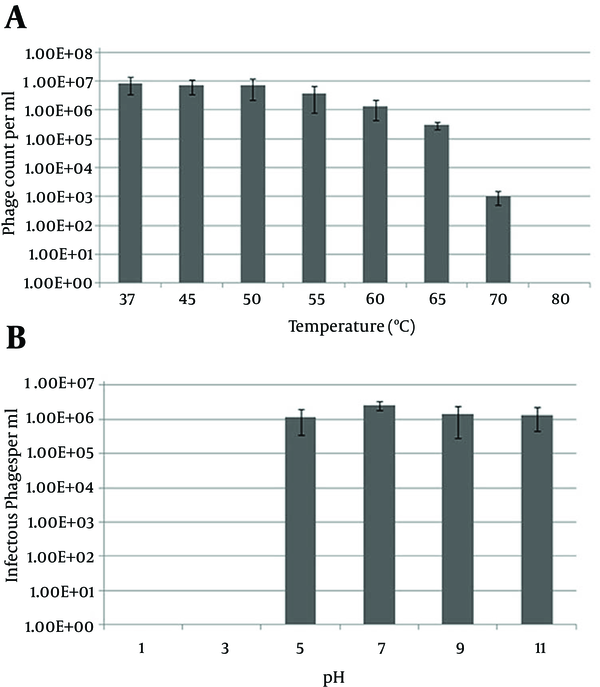 A, Stability of the MJ1 phage treated at different temperatures for 60 min; and B, Stability of the MJ1 phage after treatment at different pH values overnight at 37°C. All data are the means of 3 determinations ± standard deviations (SD). A one-step growth experiment was conducted to determine the latent time period and burst size of the MJ1 phage. A curve with three phases (latent phase, log phase, and stationary phase) was obtained (Figure 3). The latent time period and burst size were calculated as 21 minutes and 300 phages/cell, respectively. The burst size was determined from the ratio of the mean yield of phage used for bacterial infection to the mean of phage particles liberated after infection. The latent time and burst size of the MJ1 phage were deduced from the curve with a triphasic pattern. All values are the means of 3 determinations ± SD. The MJ1 phage morphology was observed by transmission electron microscopy. The phage head was 108 ± 0.2 nm long and 128 ± 0.5 nm wide, with icosahedral sides. A contractile tail of 123 ± 0.5 nm long and 15 - 26 nm wide was also found with the head. The phage was assigned to family Myoviridae on the basis of its morphology. All values were determined as means ± SD from 3 measurements. The phage tail had a few prominent tail fibers, with proximal and distal parts of about 76 nm and 66 nm, respectively (Figure 4). The genome of the MJ1 phage, as detected on 0.6% agarose gels, was a double stranded DNA of approximately 32 kb (Figure 5 A). The phage DNA produced two bands of different size upon EcoR1 restriction (Figure 5 B). A total of eleven proteins, ranging in molecular weight from approximately 17 to 200 kDa, were detected by SDS-PAGE in the MJ1 phage (Figure 5 C). A, The MJ1 phage genome, as detected by agarose (0.6%) gel electrophoresis. Lane 1 shows a high range DNA ladder (Gene Ruler) and lane 2 shows a band of phage DNA having a size of approximately 32 kb; B, Lane 1 shows a 1 kb DNA ladder (New England Biolabs) and lane 2 shows the MJ1 phage DNA restriction analysis with EcoR1; C, Image shows the SDS-PAGE analysis of the MJ1 phage structural proteins; lane 1 shows broad range protein molecular weight markers (Precision Plus ProteinTM , Bio-Red) and lane 2 shows the MJ1 phage proteins. A culture of E. coli 3 was inoculated with the MJ1 phage with a multiplicity of infection (MOI) of 1 and the change in optical density (bacterial growth) was observed for 24 hours. An abrupt OD decrease was observed in the phage-treated bacterial culture compared to the control culture (with no phage). A rapid decrease in OD, from 0.40 to 0.12, was observed in the first 4 hours and was sustained for about 16 hours. After 16 hours of incubation, the turbidity (OD) increased, probably due to the presence of resistant bacterial cells in the culture (Figure 6). Effect of the MJ1 phage on bacterial growth of an E. coli 3 log-phase culture, compared with a control culture (having no phage). All values are the means of 3 determinations. Generally, antimicrobial drugs are used for the treatment of bacterial infections. However, due to the frequent emergence of antibiotic resistant bacteria, researchers are recommending phage therapy as an alternative therapeutic option for treatment of various bacterial infections and contaminations (8). The Eliava Institute of Bacteriophages, which is a phage therapy center in Georgia, has been testing phages as a prophylactic measure for treatment of various bacterial infections (22). Resistance to modern antimicrobial drugs is a major problem in treating current bacterial infections. Antibiotic resistance genes disseminate between bacterial communities either through different mechanisms of horizontal gene transfer (plasmids, transposons, integrins, etc.) or through vertical transfer of resistance genes from parents to offspring. This creates a challenging threat to humans due to the increased cost of hospitalization and the severity of infections. The emergence of MDR strains significantly increases morbidity and mortality (23). Beheshti Maal et al. (24) found that phages are the most abundant microorganisms in aquatic environments and play a critical role in controlling their host populations (such as algae, fungi and bacteria). Therefore, phages could be used for the elimination of environmental microorganisms that pose threats to public health. Many researchers have successfully used some phages for therapy of various infections caused by bacteria; for example, phages have been used for both treatment and prophylaxis of E. coli infections in research animals (i.e., mice) and farmed animals such as lambs, calves, and piglets. Bacteriophage therapy is viewed as a promising approach for curbing various bacterial infections (25, 26). None of the known phages reported in the literature are lytic to all E. coli strains. Therefore, the underlying aim in finding and characterizing novel and potentially therapeutic phages is to identify phages that show a high specificity and a narrow range against newly emerged MDR E. coli strains. Our test of 10 different commercially available antibiotics against E. coli 3 revealed resistance to 7 out of 10 antibiotics (Table 1). Bacteriophages are usually found in close proximity to their host bacterial species (8). Sewage water serves as a rich and diverse source of microbes, mainly due to the presence of animal excreta and hospital drainage (27). The MJ1 phage was also isolated from sewage water. This newly isolated virus was highly lytic, giving clear plaques of an average diameter of 0.8 mm. The MJ1 phage showed a very narrow host range, infecting only E. coli 3, E coli LF 1969, E. coli F, Achromobacter xylosoxidans, and P. aeruginosa 2995, among the bacteria tested here (Table 2). Several phages have been reported that are very specific to their host cell receptors (27). A number of studies have reported that bacteriophages may vary in both their thermal and pH stability. Our investigation of these parameters in the newly isolated MJ1 phage revealed a high tolerance to a wide range of temperature, from 37°C to 65°C, but the phage was killed at 70°C. The MJ1 phage also showed good stability over a wide pH range from pH 5 to 11, with maximum stability at pH 7. This finding was in agreement with earlier observations of Carey-Smith et al. (28) and Jamalludeen et al. (16), who reported that most phages thrive well at a pH range of 5 to 9 under physiological conditions. The native virion structure and stability were maintained throughout this pH range. The isolated MJ1 phage was inactivated at lower pH values of 1 and 3. Bacteriophages are usually less stable in acidic environments due to denaturation of their proteins (29). Phage characteristics such as heat and pH stability are important properties that could be significant in various aspects of phage therapy. Curves obtained from one-step growth explain various replication steps in the phage life cycle. The MJ1 phage showed a latent period of 21 min and a burst size of 300 virions per cell. Jamal et al. (30) reported a latent time of 24 minutes and a burst size of 320 virions per cell for the WZ1 phage, in agreement with our results. On the other hand, Sillankorva et al. (31) previously reported a small burst size and small latent time period, indicating that both latent time and burst size vary among different bacteriophages. Various parameters, such as inoculation timing, phage absorption rate to the host, and burst size, are also critical to the success of bacteriophage therapy (32, 33). Ackermann (34) described phages as comprising fourteen (14) families (officially accepted) and at least five other families still awaiting classification. Nearly 5,500 bacterial viruses have been studied with the electron microscope. According to ICTV, the long tail of the MJ1 phage would place it within the family Myoviridae of order Caudovirales (23). Treatment of an E. coli 3 planktonic culture with the MJ1 phage resulted in a significant decrease in the turbidity of the culture, when compared to the control. This inhibitory effect on growth was observed for up to 16 hours, indicating the impressive potential of this phage for employment in phage therapy. 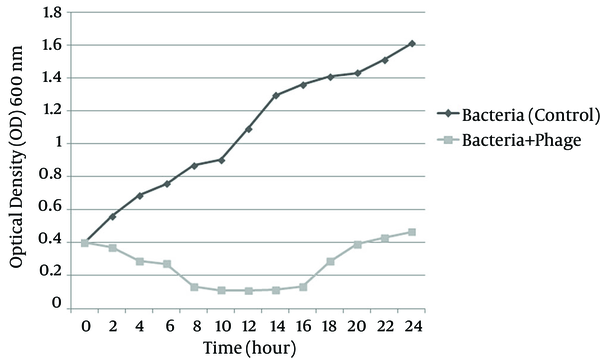 The maximal bacterial lysis was observed during this 16 hour time period, but increased turbidity was again observed in some cultures after 16 hours. 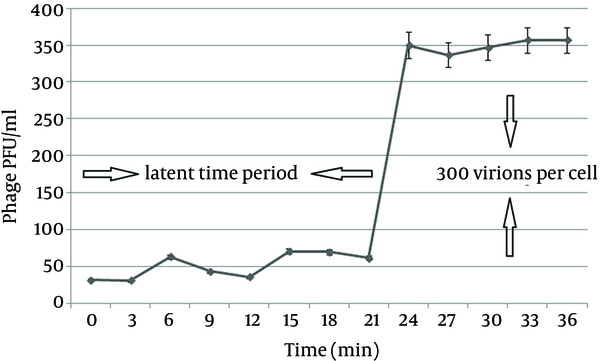 This increase in turbidity may be attributed to the emergence of resistant cells which, although initially fewer in number, caused an increase in turbidity, hinting at a rapid rate of bacterial regrowth after 16 hours (Figure 6). These phage-resistant bacteria may threaten the future acceptance of phage therapy and bacterial control. Several studies have shown that the phage-resistant bacteria tend to lose their virulence factors, as these factors may be the potential sites for phage infections (27). This property has been demonstrated, for example, in fish pathogens (35). Conversely, the gradual increase in OD might be due to other factors, including increases in bacterial debris and other metabolic products, which would hinder the reporting of actual results of this type of study (27). In conclusion, the virulent MJ1 phage infecting E. coli 3 was characterized as a DNA phage belonging to the Myoviridae family. This phage was very proficient in the eradication of an E. coli 3 planktonic culture and showed some remarkable properties, including rapid replication, heat tolerance, and stability at wide range of pH. It also possessed a latent time period and burst size suitable for bacteriophage therapy. Taken together, these characteristics make the MJ1 phage a promising candidate for phage therapy against E. coli 3 infection and contamination. Dr. Kalina, emerging pathogens institute (EPI), university of Florida, is acknowledged for her help in experimental work. K. Kelley from Interdisciplinary center for biotechnology Research, university of Florida, USA is acknowledged for performing the transmission electron microscopy. Dr. Nighat, from Rawalpindi Railway Hospital, Pakistan is acknowledged for providing the strains to carry out the host bacteria range determination. The higher education commission (HEC) of Pakistan is acknowledged for funding this study. Authors’ Contribution: Muhsin Jamal has performed all the experimental work and also wrote the manuscript of the research paper. Tahir Hussain has performed the statistical work. This research work was supervised by Saadia Andleeb and Chythanya Rajanna Das. The final manuscript was accepted by all co-authors. Funding/Support: This study was funded/supported by higher education commission of Pakistan.